Local discounts at salons, restaurants and much more! If travelling abroad, the ISIC provides access to discounts on accommodation, admission to historic sites, museums and entertainment venues. in some countries it is the only accepted form of student ID for visitors. 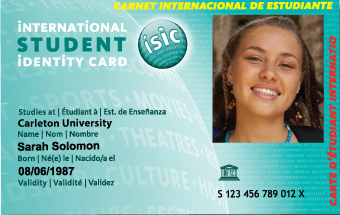 The ISIC can only be issued to full-time students. Check out your student handbook for a discount listing or visit isiccanada.ca. To get the ISIC , visit isiccanada.ca/card/. You can also visit our office and our Office Administrators will help you through the process. Note: At this time, cards have gone virtual. You can buy a physical card for an additional cost through ISIC Canada.